UPDATE: This restaurant is now closed; Oriental Charcoal BBQ is now here. 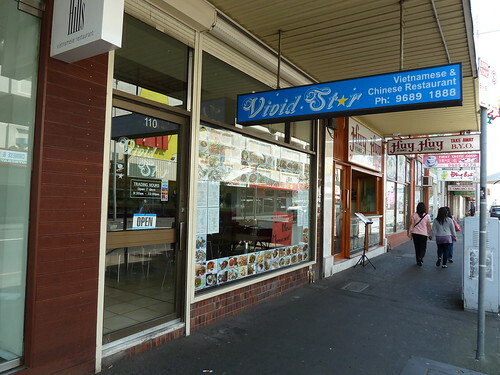 Vivid Star has recently opened on the site of the old Quan Hue. It's a bold move, being between people's favourite Sapa Hills and reliable stalwart Huy Huy. I refuse to segue with something lazy like (cue serious movie voiceover voice) "but is its star indeed vivid among the galaxy that is Hopkins St?" Oh - guess I just did. Their menus are gorgeous - lovingly put together with careful formatting. Don't bother bringing the paper with you - I was happy to browse the voluminous pages and ponder what my next meal or ten would be! 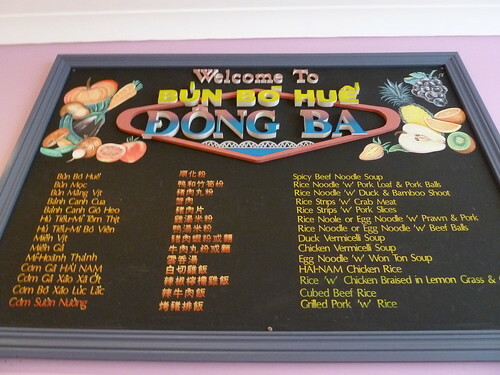 It spans everything from Vietnamese classics such as hu tieu mi and pho soups to Chinese-style stirfries and steamed whole fish. Loving this - an equation to deliciousness! 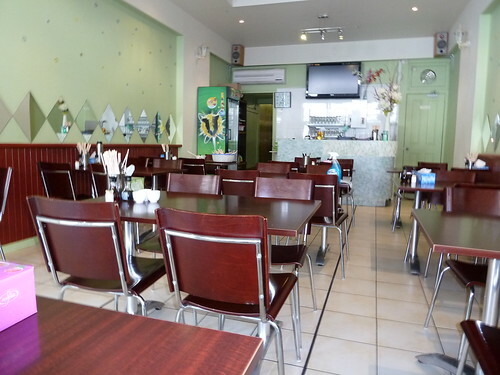 Vivid Star is a Vietnamese Chinese restaurant. For a long time I eschewed the Chinese side of the menu of these places, assuming that it was an afterthought tacked on merely to appease Westerners. I was totally wrong. There is a large Chinese community in Vietnam who have called it home for in some cases hundreds of years. Many fled following the end of the Vietnam War, becoming "boat people" and eventually settling in Footscray and elsewhere around Australia. 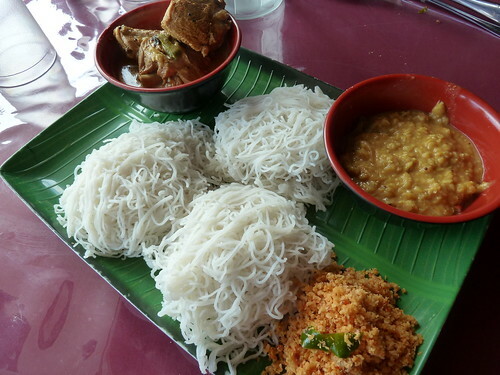 They have retained their Chinese identity and Cantonese language, and their cuisine although Chinese at its origin bears the hallmarks of their life in Vietnam. 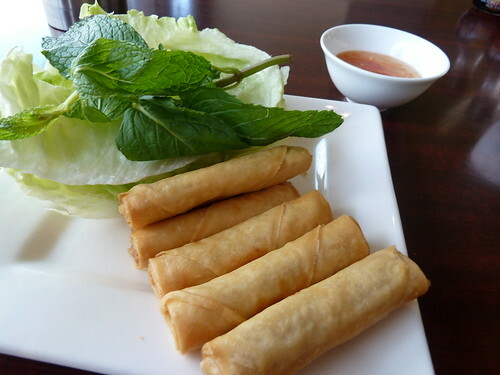 Simon and Courtney on the FFB Facebook page had given Vivid Star the thumbs up with Courtney making the bold claim of best pork spring rolls she had ever had. 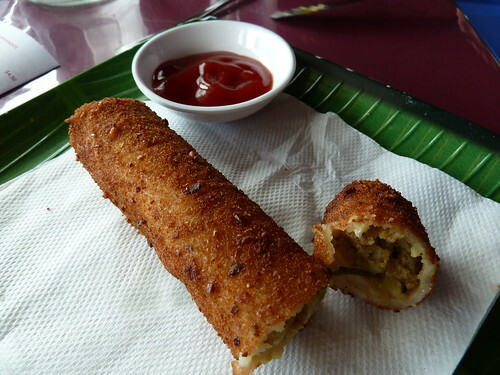 They were good - fat and golden cigarillos with quite a plain minced pork filling. Wrapped in lettuce with a swizzle in the spicy nuoc mam cham - yum! I do like more lettuce and mints though! 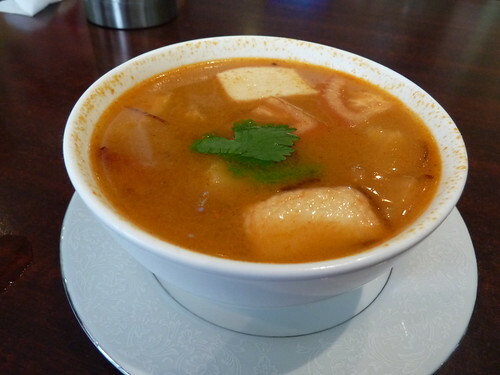 My mother was on the hot & sour soup trail but had to settle for tom yum soup. I know it's not very Vietnamese but it was delicious, a perfect combination of sweet, sour, fishy and spicy, with fat and juicy tofu, a freshly cooked prawn, tomato and pineapple. 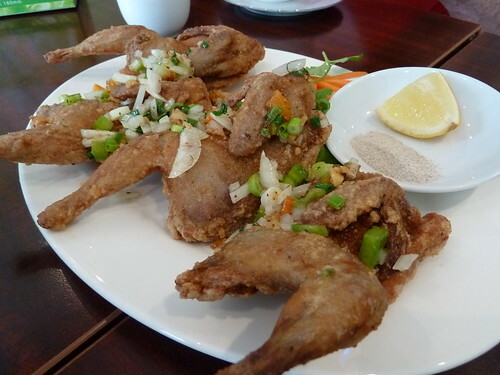 Oh, so crispy, yummy, rich and juicy quail. You squeeze the lemon into the salt and pepper mix to make a delicious dipping sauce. I think my favourite part of salt and pepper dishes, though, is actually the lightly wokked sprinkle of chilli, garlic and spring onion that goes on top. 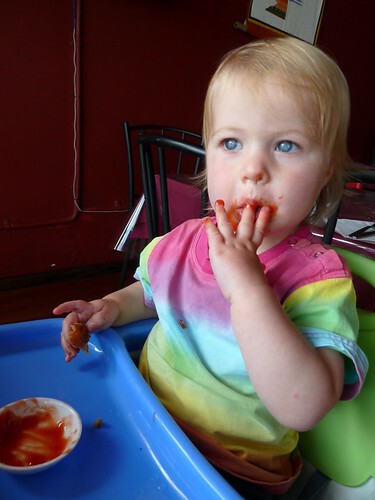 Halfway through I found my daughter eating the wing tips, bones and all, like chips. Talk about calcium! This was excellent with juicy chicken chunks and crisp vegies. There's such variation in "chilli and lemongrass" dishes, I find, and in some you can taste neither chilli nor lemongrass. Not so Vivid Star's version. The lemongrass was clean and fresh, not at all gritty and there was just enough chilli to keep it interesting. 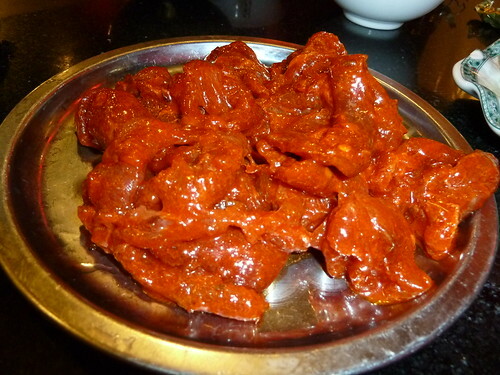 Bo luc lac or "shaking" beef is so called for the way you shake the wok when you cook the small cubes of beef. 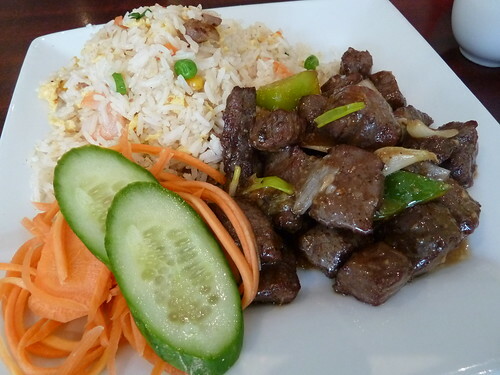 It's a genuine Vietnamese dish, traditionally made for celebrations due to the high price of beef, but also a great option for people unfamiliar with Vietnamese food. It is most traditionally served with red tomato rice but I was intrigued by the Yang Chow fried rice on the menu. This turned out to be Cantonese-style fried rice made with a little BBQ pork - simple but very good. The beef was great, garlicky and tender. In traditional Anglo-Australian cuisine, soups tend to be merely a prelude to the main meal. 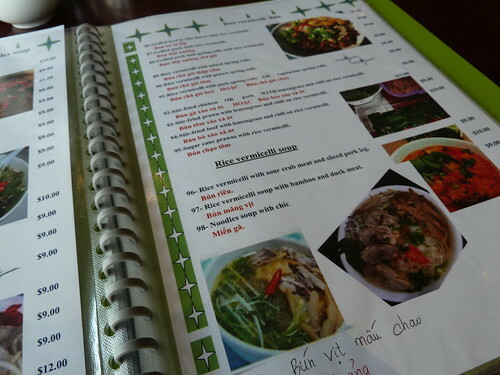 It is definitely not so in Vietnamese cuisine where there is a whole repertoire of soups, all made unique by special stocks, noodles and toppings. 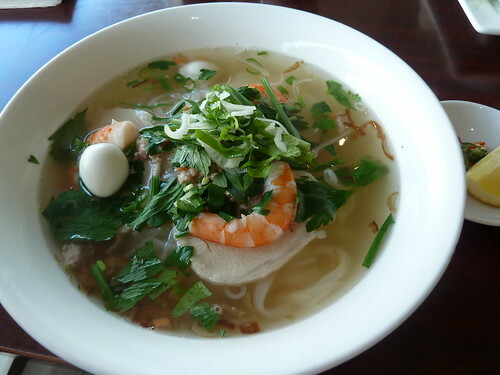 This is hu tieu kho Nam Vang or Cambodian-style noodle soup. 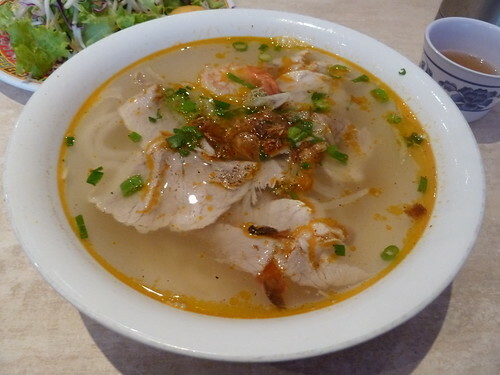 This dish has a really interesting history which Viet World Kitchen has explored in typically excellent fashion, but basically it is a Southern Vietnamese take on Cambodian noodles (Nam Vang is Vietnamese for Phnom Penh) which are in turn, a local version of Chinese noodles. 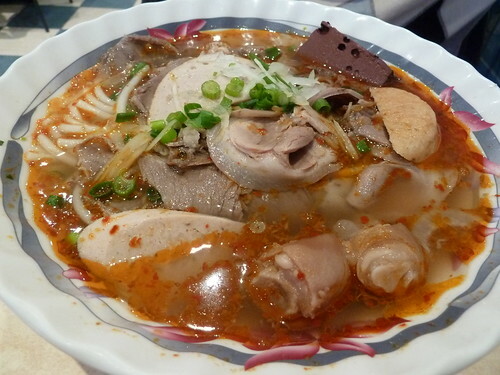 This soup was great, mild broth concealing square-cut, translucent rice noodles. The bowl was dressed with plenty of herbs and I was somewhat shocked to find what I thought was parsley! It worked surprisingly well, though, and I later realised it was Chinese celery (celery and flat-leaf parsley are closely related - look at the shape of the leaves). While it had fantastic minced pork and freshly fried shallot, its other toppings let it down a bit - precooked prawn and bland pork neck. I think Vivid Star's forte is its drier dishes - if you feel like soup (other than pho), try Phu Vinh or Dong Ba (review coming soon). Vivid Star have a really interesting offer - you can bring your own fish, crab or lobster and they will cook it for you and charge you a set fee i.e. just the cost of labour and ingredients. Pretty cool I reckon. 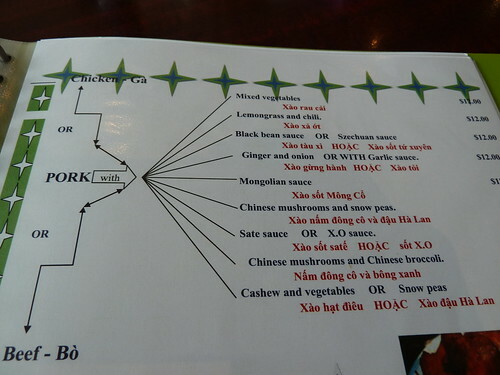 Vivid Star can hold its own among the mega-menu set on Hopkins St. Next time you are headed for Sapa Hills, give them a shot instead. Three stars! Layout: Could accommodate if not busy. 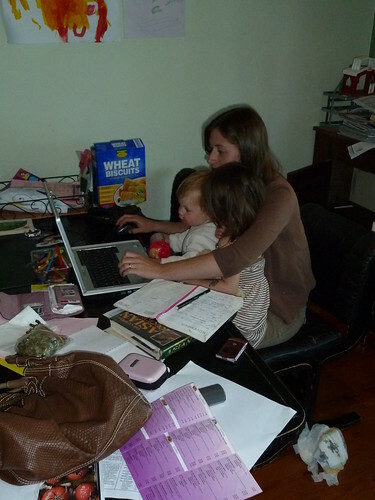 My sister took this photo of me without me knowing while I was blogging the other day. I really like it - it is such a snapshot in time. If you have no expectations, you will never be disappointed. In terms of eating out, arguably the most delight comes from the places you have little or no expectations about - the round-eyes place your friend has insisted you go to which ends up being really good, or the empty, foreboding restaurant that ends up serving you a delicious meal (and fills up with people just after you have the courage to sit down and order). Unfortunately, the opposite is too often true - the places we most build up can let us down, whether through their own shortfalls or perhaps our stratospheric expectations. 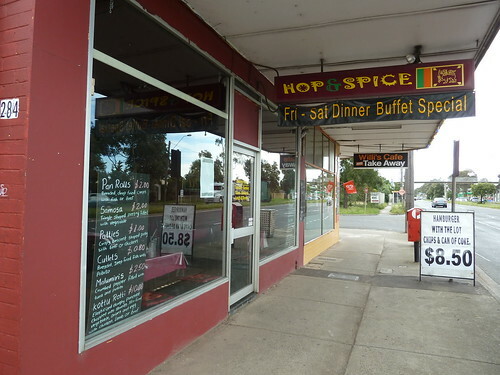 A friend and I have been excited about "the hot pot place in Barkly Street" for as long as I can remember. 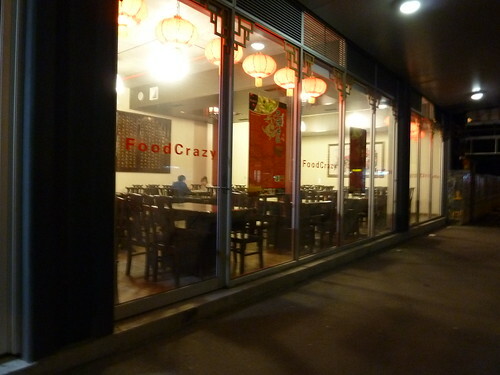 It sits under a new apartment building and took a couple of years to finally get its somewhat odd name, "Foodcrazy", displayed on the windows. Numerous attempts to go there have continually been foiled. Finally we made a date. Text messages went back and forth in a flurry - some I think were nothing but "HOT POT!!" in excited capitals. The hot pot night approached and finally arrived. 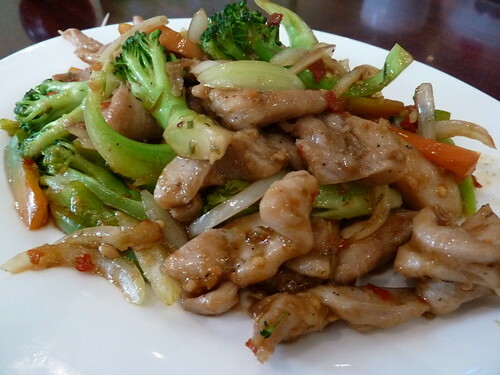 Foodcrazy serves Szechuan food from the Szechuan region in central China. 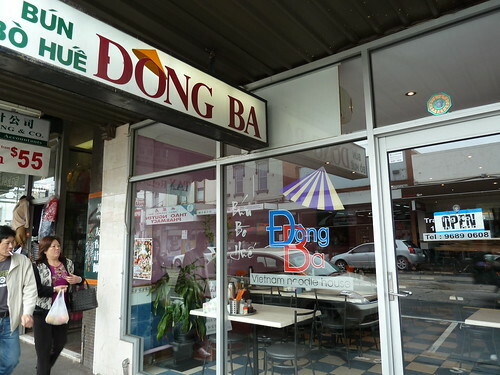 This has become quite popular in Melbourne over the last few years and is characterised by the mouth-numbing Szechuan peppercorn and liberal use of whole dried chillies. 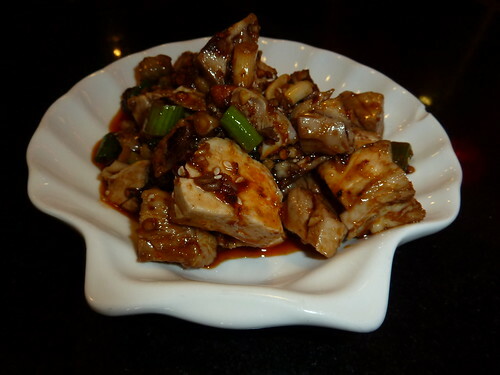 Bean sauce is a staple of Szechuan cooking, as used in Grandpa's special noodles as well as the classic Szechuan dish "ma po tofu" or "pockmarked grandmother's tofu", a warm, comforting dish of pork mince and silky tofu. 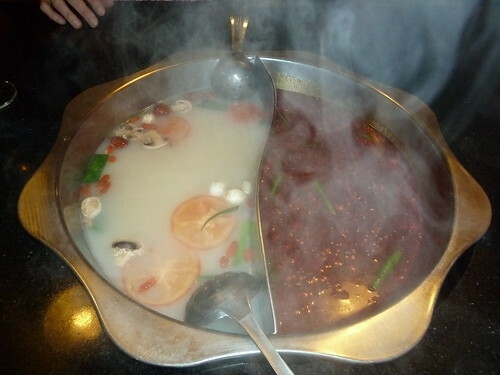 The hot pot - a bubbling pot of light stock in which diners cook their choice of meats, starches and vegetables at the table - is popular in different guises across Asia, but particularly so in the Szechuan provinces of Chengdu and Chongqing. Upon entering Foodcrazy one is asked if one would like the normal menu or the hot pot menu. 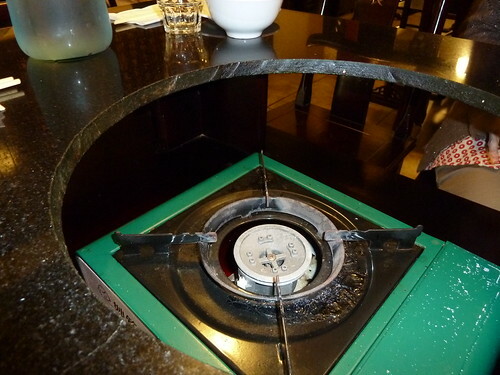 Accordingly there are two different types of marble table in the restaurant - a regular table and one with a large circular well cut into it, under which sits a small gas burner. 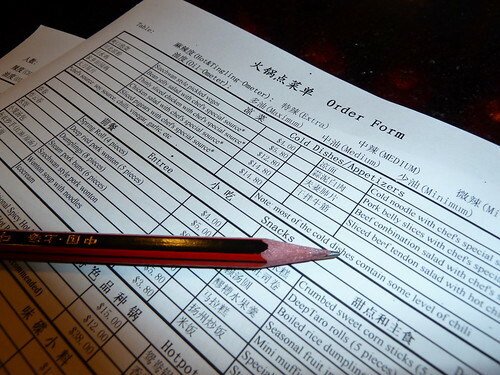 The hot pot menu itself is two photocopied "tick-the-box" order forms. One can go a la carte, paying around $15 for a pot of broth and then adding on the various meats, vegetables, condiments and sides. 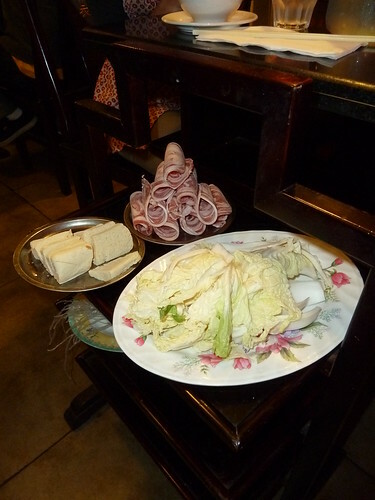 We chose to go with the buffet where for $25 each we could choose an almost unlimited array of goodies to dip in our "double-taste" hot pot, as well as a number of cold side dishes and dipping sauces. First came a delicious chicken salad in "special sauce". Poached cold chicken, spring onion and crunchy peanuts in an oily, chilli sauce - I believe this is the famous Sichuan mala sauce? Love the 'Nanna's soap dish' plate. We also chose the Szechuan pickled vegetables. 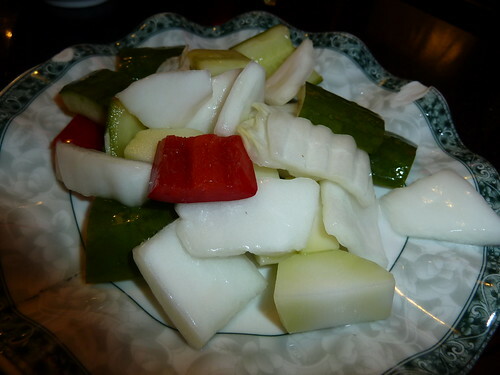 These were different to those I had had at Hu Tong recently - while Hu Tong's were spicy, a little oily and hot with green chilli, these were large, sweet and very mild - similar to Vietnamese pickled vegetables. Still, they were really good. The moment arrived - our 'double taste' hot pot was finally here!! 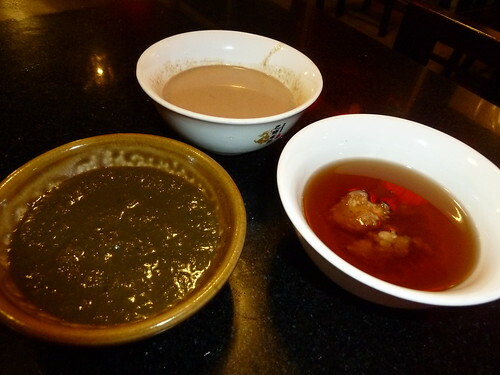 One side was evidently a very mild broth, perhaps chicken-based, while the other was a very dark brew, slicked with oil and full of bobbing Szechuan peppercorns and dried chillies. Our goodies arrived and were placed on this neat little shelf at the side of the table. Above you can see 'frozen tofu', lamb (strange, circular, very fatty frozen slices), 'seasonal vegetables' (wong bok) and underneath 'sweet potato noodles'. We also ordered the chef's special beef as well as the 'blue crab'. Other choices on the menu were gluten (probably like seitan?) and 'mini muffin'. 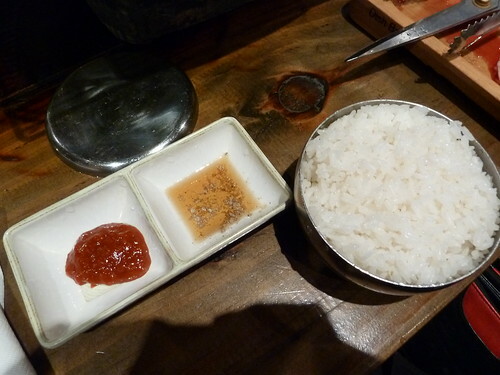 We chose a sesame sauce which was very similar to tahini, garlic oil, and paid $1 extra for chive flower paste. So, time to get stuck in. We didn't really know where to start, though. We tried to ask the staff what was meant to go where - was there some kind of system? Did the noodles go in one broth and the meat in the other? Which sauce was for what thing? They were friendly but a little bemused by the questions, just saying that yes, you cook it all in there, before leaving us to it. So we did our best. We dipped, we swirled, we scooped... and we did not like it. The noodles got lost somewhere at the bottom of each murky broth and were extremely hard to fish out, constantly slithering back in like a giant squid's tentacles off an ancient mariner's ship. The lamb slices were unpleasantly fatty, like streaky bacon, but without the corresponding smoky, delicious flavour. The 'chef's special beef' was heavily treated with bicarb, giving it a strange spongy consistency. The 'frozen tofu' was just that - frozen tofu - and if you have ever, like me, left your tofu up the back of your crappy share-house fridge only to find it rock hard, you will know that tofu does not freeze well, losing its structure and becoming soft, watery and mushy. Not nice. We tried to be positive. I tipped various sauces on various things, having no idea what went with what. The chive flower paste, although it had an intriguing grassy scent, was so heavily salted it was inedible. 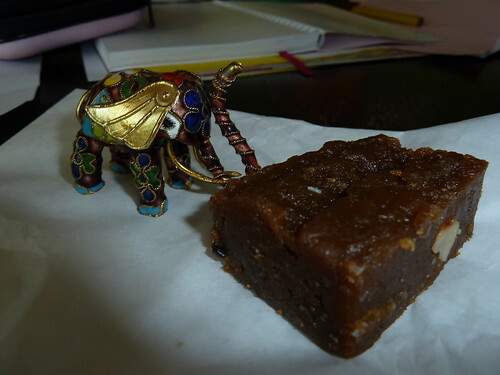 I did enjoy the sesame paste, though, and the cabbage was quite nice. I did not like the chilli broth at all - the Szechuan peppercorns were almost whole and gave the noodles fished out of there an odd gritty consistency. The mild broth was flavourless. To add insult to injury, we never received our 'blue crab', and upon reminding the staff we were summarily presented with a plate of frozen crab sticks. Eventually we both stopped eating - still hungry, but with totally no appetite for the food. We scrambled for the last of the pickled vegetables. Even the cold chicken salad had lost its shine by then, the oil separating from the dressing and making it greasy and unappealing. Upon leaving my friend remarked that it had seemed like fast food. I didn't know what she meant but after some research, it appears that Foodcrazy is part of a Chinese chain who have two other restaurants in Melbourne. I hesitate to totally bag it, though. 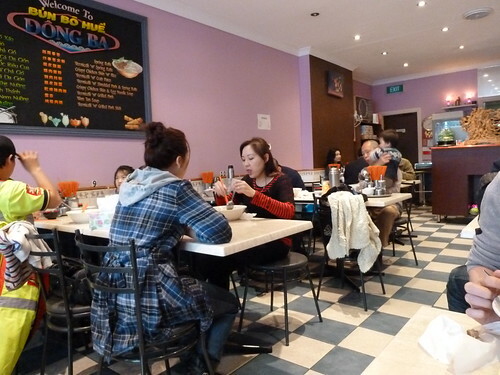 We had no idea what we were doing, really, and to say that the hot pot at Foodcrazy is bad or indeed that Szechuan hot pot is bad is like pouring orange juice over Weet Bix and then saying Weet Bix are bad. I am reminded of the time I sat next to an older Asian gentleman on a flight somewhere. We were presented with a scone and I watched him cut it up with his knife and fork and eat it, without butter, jam, or anything. It must have tasted horrible. I wanted to tap him on the shoulder and tell him that he should cut it in half, spread it with a little butter and/or jam, ask for a cup of milky tea and then enjoy what is quite a nice afternoon snack - not to mention the virtues of homemade scones with stawberry jam and stiffly whipped cream with a pot of proper leaf tea. So perhaps there was a secret to the Szechuan hot pot we did not grasp. Luckily our enthusiasm for 'HOT POT!!' has not waned and we next plan to try Vietnamese 'steamboat', hoping that it will have perhaps a clearer stock and fresher ingredients. The anticipation is building. We really should keep our expectations in check... but anticipation is the purest form of pleasure. OK, I think I made a bad call. 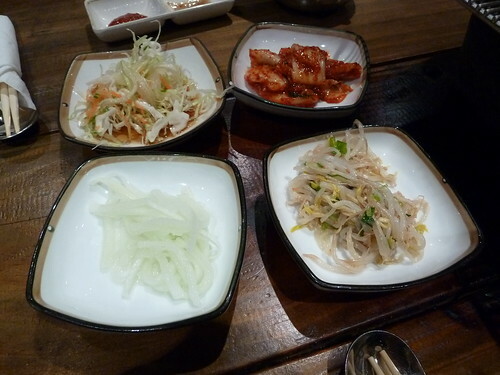 Hyeung Jae in Hopkins St, aka "the new Korean BBQ place", is not that great after all. I took a group of friends there having raved about it and we were all sorely disappointed. Yes, the pork belly was good, but the portions were smaller, the seafood pancake mushy and gritty, the bulgogi soggy and sweet and the salad underdressed. Maybe it was just that night but I really am sorry if I sent you there on a fool's errand. 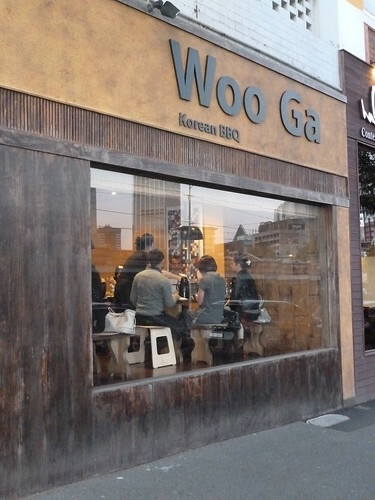 Anyway, I have the cure for all your Korean BBQ cravings - Woo Ga in West Melbourne! I love the whole thing in Melbourne where we love to make "little" things - kind of like our revolt against the rest of Australia's obsession with big things. Three restaurants of one ethnicity or cuisine and suddenly a strip is "Little Athens" or "Little Tokyo". Following this logic, "Little Seoul" is along Victoria Street in West Melbourne, facing the Queen Vic Market and under the shadow of the tall city buildings beyond. 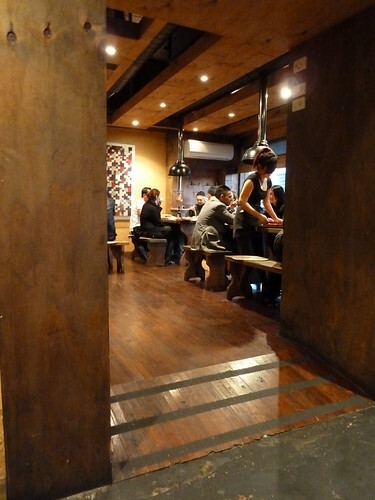 Wooga is all wood inside, with chunky tables with dark centres scarred from innumerable charcoal braziers being placed on top. 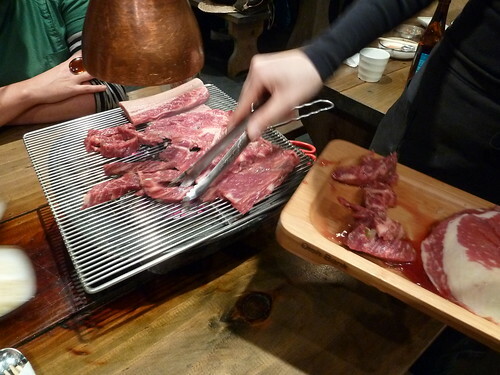 Its specialty, you see, is Korean BBQ which is traditionally cooked semi-DIY-style at your table. Despite going on a Monday night it was packed. We chose a banquet that come with marinated topside, beef brisket and a butterflied beef rib ($39). A great stone bowl of real charcoal is placed in the middle of the table, radiating warmth, and a removable grill placed over the top. 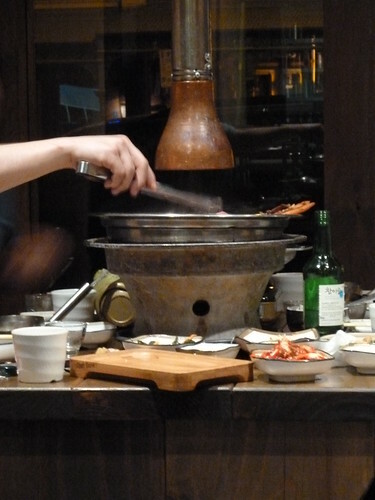 The staff expertly place the meat atop the coals for you and any smoke is sucked up the retractable, practical yet attractive copper flue that hovers above each table. One thing I love about Korean BBQ is the little archipelago of side dishes you can flavour-hop between while waiting for your meat to be done. Here we have sweet, tangy pickled onions that had a slightly hot and spicy onion kick in the tail; a riotously crunchy slaw with a light sesame and vinegar dressing; the most fabulous kim chi, fermented cabbage in a mild yet flavoursome chilli sauce; and a warm salad of gently wilted bean sprouts tossed with sesame. As is traditional, when finished all of the dishes will be refilled ad infinitum. When the meat is done, you can dip it in either this Korean bean sauce (somewhat like hoi sin but with a much less cloying flavour) or sesame oil mixed with a little minced garlic and pepper. Atop a little rice, a bit of Wooga's grilled beef is a little slice of heaven. I think my favourite was the marinated topside, having the right amount of weight to undergo enough grilling to have both caramelised exterior, tender interior and plenty of real beefy flavour. The thin butterflied beef rib was very good too, and the wafer-thin brisket was tasty but needed careful attention it did not overcook. 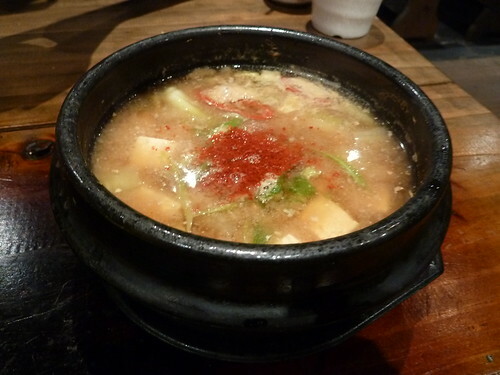 Also included in our banquet was the "bean paste soup" - a rich, tasty, miso-esque broth with a little of that mild chilli that coated the kim chi, loaded with diced silken tofu, potato, zucchini, onion and spring onion. Miso with benefits! What a lovely, social, interactive way to enjoy a meal. It was such a step up from Hyeung Jae. We were delighted too to get the bill and find out that it had been $39 for the entire meal rather than $39 each. Awesome value! The staff were delightful, there was cool jazz piano playing, and it was a buzz to walk out the door and see the city right there. The city skyline - that's a big thing I rate wholeheartedly. I love the old-school neighbourhood shopping strip - you know the one - set back just a little from the main road, 45-degree angle parking set into the kerb in front. There is usually a fish & chip shop, a hot bread shop and always something random like a bulk nappy outlet or "Yvonne's Yooniverse of Yarn". More and more, though, there are empty, shuttered shops. Such would be the case for this little strip in Mitchell Street, Maidstone, if not for Los Latinos - a little ray of Latin American sunshine! I was lucky enough to have dinner with Deb of Bear Head Soup who, aside from being an absolute sweetheart, is a fellow Mesoamerican food tragic. 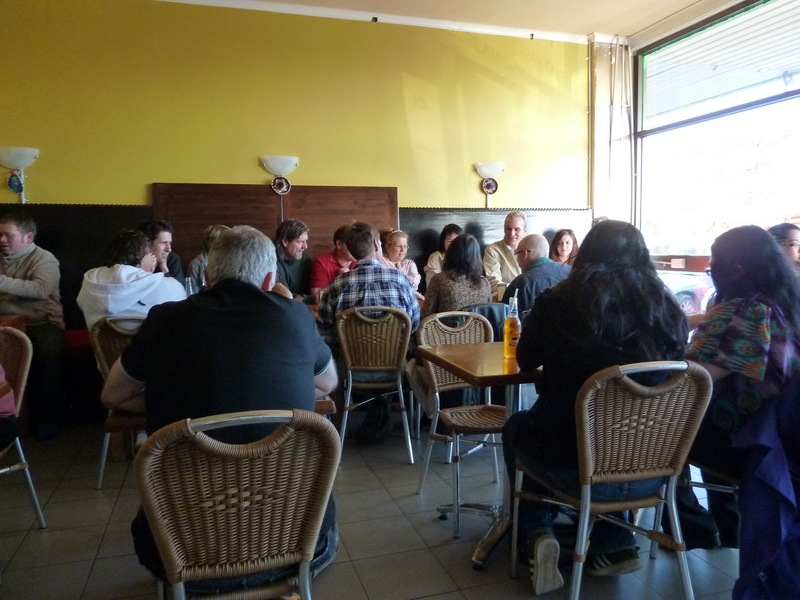 We thought we would duck the crowds by meeting at 6.30 pm on a Wednesday﻿ but even then the little place was packed. Service is slow but don't hold that against them - they are absolutely snowed under! 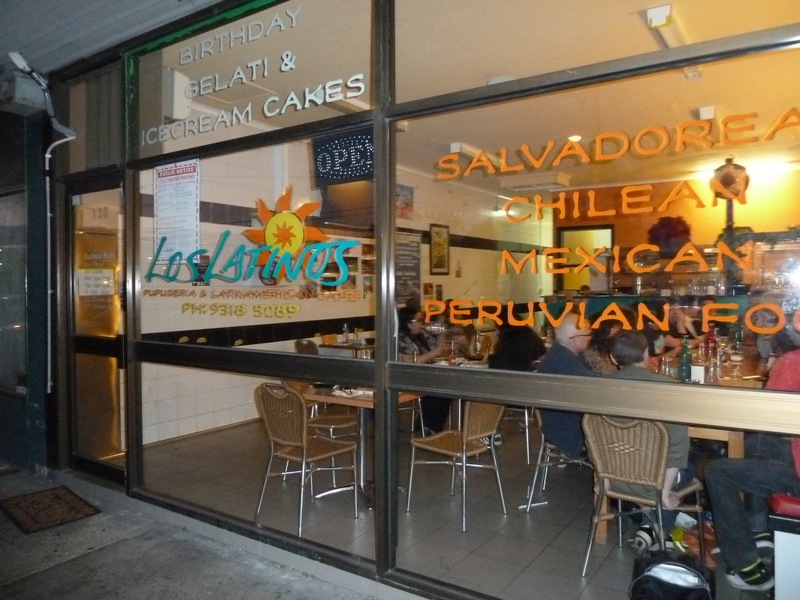 Los Latinos serves food from across Central and South America with drinks to match. We chose Guava and Grape ("uva", related the Latin for eggs, from whence comes "ovary" - sorry, frustrated linguist here) varieties of Jarritos soft drink which is served in all good Mexian taquerias in the States. They were teeth-achingly sweet but good. 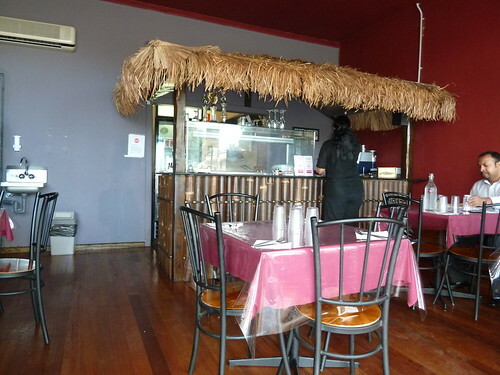 We waited and waited and were just planning our escape to plan B (Hung Vuong) when the food finally began to arrive. 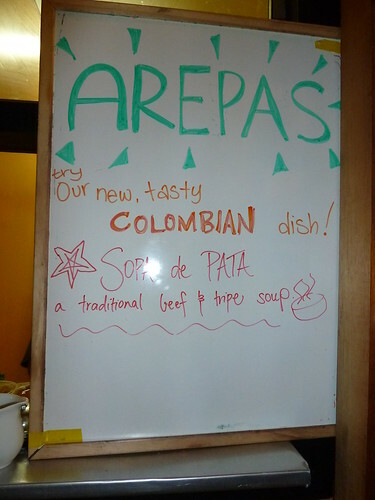 First we had one of the specials of the day, arepas, a Columbian version of El Salvadorean pupusas. These stuffed pancake-like snacks differ in that they are made with different sorts of flour. 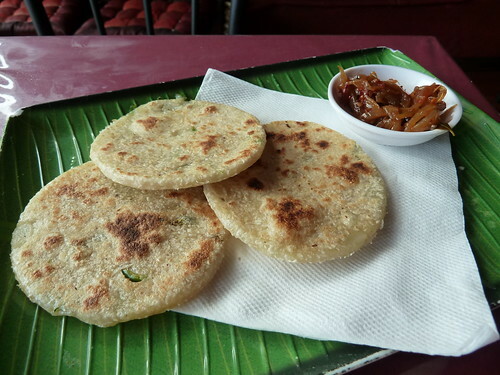 Both snacks use corn flour but the masa (flour) for arepas is not treated with lime as is masa harina (sounds scary, is actually totally natural - lime is an alkaline mineral substance that encourages the skins to separate from the kernels.). The flour or masarepa for these had a slightly coarser texture, not unlike a thick-grained polenta. They were stuffed with a stretchy white cheese and were absolutely delicious. The sauce on the side was a tangy green tomatillo salsa that complemented the rich yet simple cheese perfectly. This was so incredibly yummy.﻿ Little disks of authentic chorizo, fried so their edges began to curl up, in a rich tomato, capsicum and onion sauce. 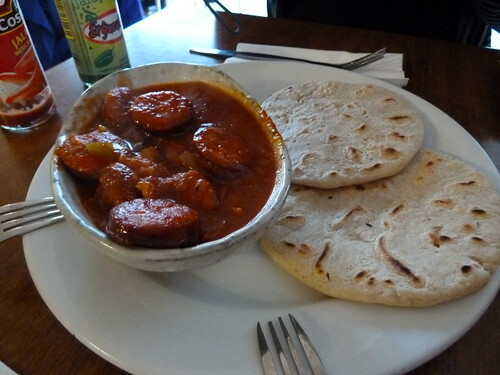 This is the best chorizo I have had since first having it in London many years ago. It came with two home-made tortillas which I have to say I found somewhat thick and stodgy, but I think they were meant to be thick like that for dipping. 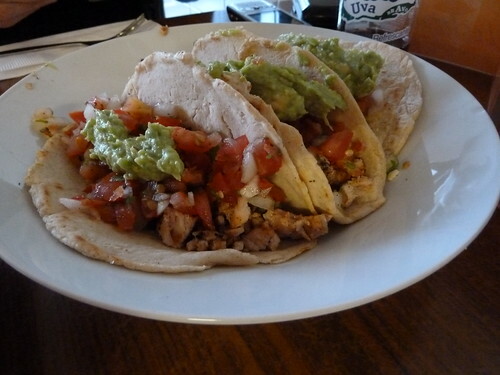 We went for the chicken tacos too, three tacos a steal at $10.50. These were good with tender chopped chicken, a simple tomato and onion salsa and a spoonful of benign guacamole in a home-made tortilla (thankfully much thinner than those served with the chorizo). They came with a mild chilli sauce and a very smoky chipotle BBQ-style sauce. The tacos were good but I think Los Latinos has more exciting things on the menu. 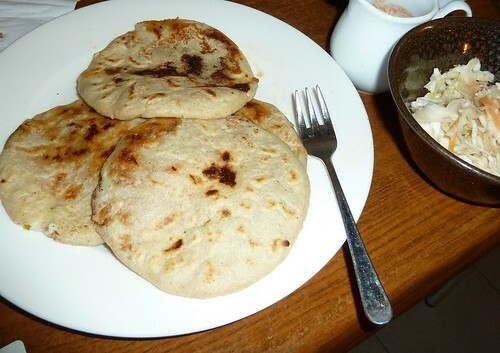 My friend K with whom I had travelled in the States had eaten pupusas the night after I left and she had raved about them. I had sighed and thought there was no chance I could try these little babies until I was next in the States, and then as if by magic the review appeared in Age revealing that there was a pupuseria not just in Melbourne but right near me! These are so, so yummy. 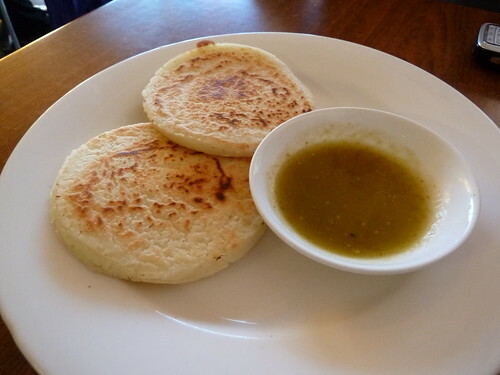 They are stuffed pancakes similar to the arepas but made with masa harina, the same dough used to make tortillas and tamales. These were stuffed with a little mashed beans and tangy cheese. They came with a super-tangy slaw and a little pot of mild chilli sauce. Fantastic!! 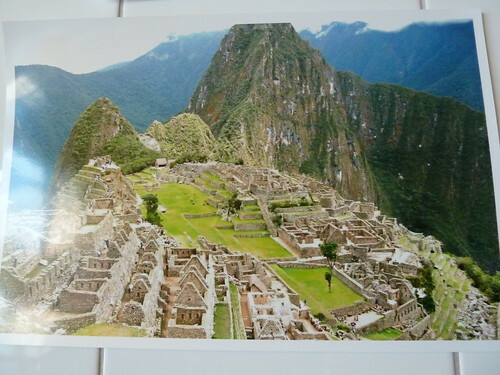 I can't wait to back there with the family; kids would love the arepas and pupusas in particular. Be patient with the service if they are busy. They are applying for a liquor licence. It is so great to see the bright little shopfront among all the other "dead" shops in the strip and I can only hope this trend will continue across Melbourne, that niche restaurants can find a foothold in these dying strips where there must be cheaper rent, simultaneously revitalising them. Thank you Anonymous (commenter on Pho Tam) for suggesting Los Latinos! I love getting all your tips and suggestions for reviews or dishes to try. Keep them coming! Door: Moderate-sized "lip"/small step to enter. Layout: Small but could accommodate if not a busy time.